GJD has announced the launch of its IPAnything module (IPA). The IPAnything is a simple yet powerful input/output controller, which is designed to convert any type of analogue sensor to an IP system, or vice versa. 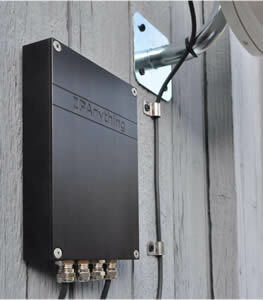 The IPAnything is built in a compact, heavy duty waterproof housing. It is fitted with a 12V/24V DC socket to power the sensor, four alarm inputs, three relay outputs and an analogue input, this ensures that the IPAnything can truly handle all types of equipment. The IPAnything allows the installer to create individual network alarms to connect video management systems (VMS), IP cameras or other network devices. It also enables the installer to monitor and control alarm sensors, sirens, gates and lights. In addition, its web based user interface is an intuitive way for installers to configure network alarms for integration with VMS software, or direct control of cameras. The IPAnything provides flexibility as it is easy for installers to add IP devices onto an analogue based security or home automation system. This has many advantages including a cost effective way to future proof the site as new actions can be created and adjusted over the network. It is also simple to add additional IP products onto the network. Greg Stuttle, Business Development Manager at GJD commented: “The IPAnything is an extremely useful device. It has proved itself to be a very versatile product as it is a problem solver for projects that require analogue equipment to be converted on to an IP system”. Another huge benefit of the IPA is that it is powered by PoE, which is more cost effective and environmentally friendly than connecting to mains power. PoE provides advantages such as reduced overhead costs from the reduction of power outlets required per installed device. Another key benefit is reduced cabling on site, this makes the installation look neater.